Lisbon has been increasingly attracting visitors from around the globe due to its charm, beauty, architecture, tasty cuisine and friendly people. As such, every season of the year is a busy time to find the ideal accommodation to spend a splendid time in this non-stop city. We recommend to all FBHC2018 participants to book their hotels as soon as possible! 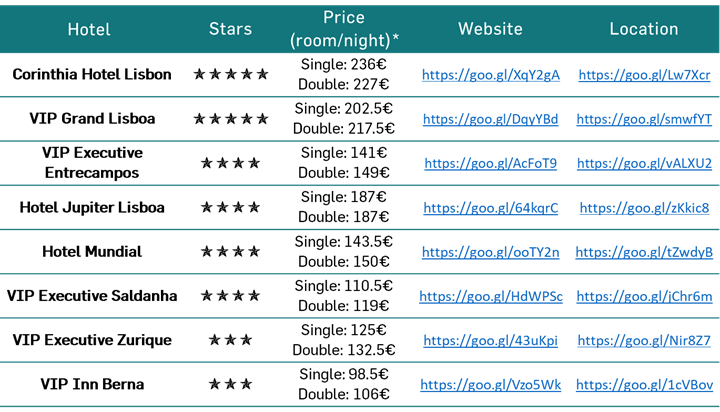 Bellow you can find some suggestions near the conference venue and in the heart of Lisbon provided by SLIDE IN Travel. *All prices are indicative and include breakfast. Keep in mind that only a limited number of rooms at this pricing are allocated for this event and reservation will only be made upon request. For more detailed information and booking reservations please contact Nuno Seabra (nuno.seabra@slidein.travel) and indicate that you are attending FBHC2018.